We’d love your help. Let us know what’s wrong with this preview of An African Centered Response to Ruby Payne's Poverty Theory by Jawanza Kunjufu. To ask other readers questions about An African Centered Response to Ruby Payne's Poverty Theory, please sign up. The author did a much better job using valid research references than Ruby Payne does. His recommendations for closing the poverty and educational gaps sound more solid than Payne's. In my opinion, Payne's recommendations are only behavioral, while Kunjufu's may actually get more deep down to the root problems faced by impoverished Americans; particularly African Americans. However, I still get a sense of bias--much like the sense of bias I felt when reading Payne. Wow, this book is just terrible. The author almost routinely misrepresents Ruby Payne's positions, making any ensuing "critique" worthless. Anyone (except maybe this author) can win an argument against a strawman of his own concoction. I was really interested to read a counterpoint to Payne's book, but unfortunately this book is a total waste of time. I found this book to be biased at times. Additionally, the charts and tables were not valid due to the date of their origination. However, it lent great perspective to strategies for successful academic engagement of African American Students living in poverty. 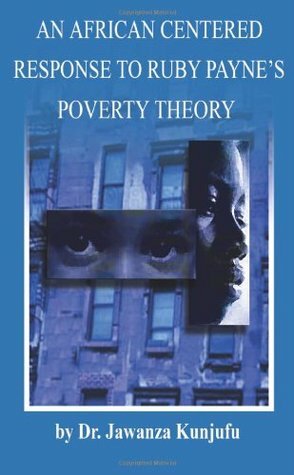 This book makes you think about important issues- is poverty impacting success or racism? Written from a different perspective than of a white person, it makes you question your assumptions and what you consider to be truths. Very good read that gives solutions to better schools, better teachers, better students, and starting to eradicate poverty.